Previously, when Karolinska doctors sent blood, plasma or tissue to the laboratory, this was a manual process. Laboratory orders labels were printed from a regular laser printer. A whole sheet of labels was needed just to print a single label. This was an unnecessary waste of resources. Additionally the printed labels were not logged into the hospital’s journal system. This resulted in mistakes. A journal system called TakeCare enables Karolinska hospital personnel to follow up on a patient’s health care history, from anywhere in the hospital that it’s held. This greatly reduces the risk for providing the wrong treatment due to incomplete information. Zebra® printers are used for labelling orders for blood, plasma and tissue tests to be sent for analysis. 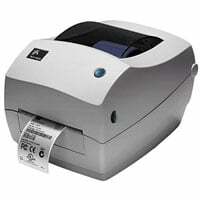 They are also used for patient labels and ID-bands for acute cases. When a doctor orders a blood, plasma or tissue test, he enters the order into the TakeCare system, which in turn generates a barcode and a LID (laboratory identity) number. By integrating orders with the journal system, the process has become transparent. It is easier to see if and why a test has not been analysed. Also, as each test is directly linked to a specific patient’s journal, the possibility of incorrectly identifying the results or the patient is almost completely removed. The fact that all orders have been integrated with the TakeCare system also makes it easier for everyone to process the large amount of daily tests. “The Zebra® printers are stable, user friendly and safe to operate, which is of critical importance to us,” said Svante Lewald, Systems Technician at Karolinska. “When you work in a hospital environment it’s important to properly understand the problems associated with handling such a high volume of identical looking items. Our largest challenge was finding a single labelling solution suitable for all the diverse hospital areas. We received a lot of help from our local systems integrator with this. However, you rarely receive positive acknowledgement for technical healthcare solutions – if it works and no one is put at risk, no one notices, you just keep going,” Svante Lewald continued. Karolinksa’s systems integrator is a specialist at integrating label and barcode systems and has helped the hospital implement and integrate this healthcare labelling solution with its TakeCare system. The Zebra® desktop printers’ reliability and user friendliness is also of great importance in an environment where the smallest mistake could have significant consequences. “We noted Karolinska’s user requirements and then produced a label material that works with Zebra® printers. Previous experience helped us a lot in this process, so that we could ensure it would be a material that Karolinska would approve. Today we deliver 4.8 million labels a year to Karolinska,” Kjell Forsberg, who works at Karolinska’s systems integrator continued. By reducing the manual work involved in handling tests, Karolinska has managed to improve overall efficiency and reduce the workload of overstretched doctors and nurses. Consequently, doctors and other hospital staff now have more time to do their job – namely taking care of patients. “This new system has brought us yet another step closer to more secure and efficient healthcare. Zebra® printing solutions and the integration with our TakeCare hospital journal system has made it easier for our doctors and nurses to administer necessary tests to patients, as well as reducing the time it takes to get results back to the medical staff,’ Svante Lewald concluded.